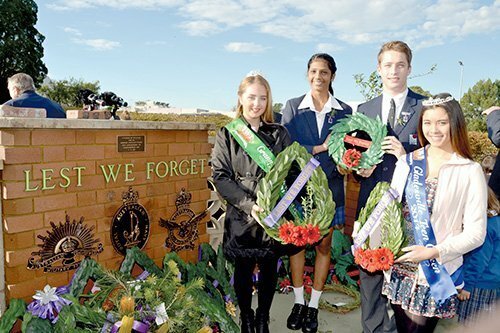 Record crowds attended local ANZAC Day Services commemorating the 100th Anniversary of ANZAC Day April 25, 1915 when many of the original Anzacs were teenagers. 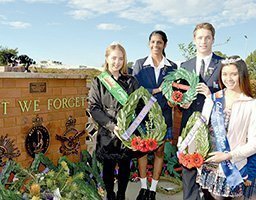 Young people were to the forefront in local commemorations including at North Ryde RSL Dawn Service when Anzac Address was presented by Ryde Secondary College School Captains Jayden Young and Vakula Bhattar, pictured above, with TWT Miss Eastwood Granny Smith Festival Queen Isabella Laguzza and TWT Gladesville Teen Queen Samantha Bowyer-Tagg representing our youth and The Weekly Times. TWT on-the-spot PHOTO.